Only one month left until Christmas, it's crazy I know! Feels like the summer just ended and all of a sudden we are having lots of snow and Christmas decorations all over the city. I like it though, I must admit. 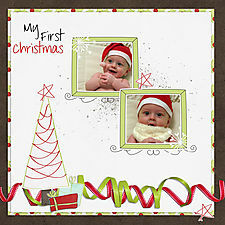 I really feel like scrapping some Christmas layouts now and I found some old pictures of Max when he was about 5 months old.